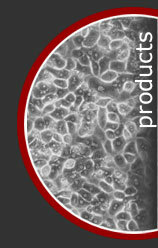 Adipocytes (fat cells) express a variety of proteins that function in the homeostatic control of glucose and lipid metabolism. Insulin regulates the translocation and secretion of many of these proteins in response to changes in energy balance. Adipocyte complement-related protein of 30 kDa (Acrp30), now known as adiponectin, is a protein whose secretion from adipocytes is enhanced by insulin stimulation. It has been suggested that the development of non-insulin dependent (Type II) diabetes may involve dysregulation of adiponectin secretion (1). In support of the link between obesity and Type II diabetes, it has been shown that decreased expression of adiponectin correlates with insulin resistance (2,3), and that adiponectin appears to be a potent insulin enhancer linking adipose tissue and whole-body glucose metabolism (4). Nemet, D., et al. (2002) Relationships among adiponectin and other adipose cytokines, body composition, and fasting insulin in lower socioeconomic middle school children. American Physiological Society's (APS) Abstracts. Kubota, N., et al. (2002) Disruption of adiponectin causes insulin resistance and neointimal formation. J Biol Chem. 277(29): 25863-6 (Epub 2002 May 24). 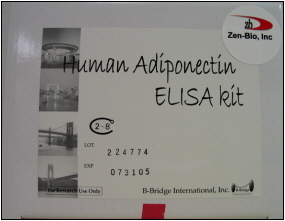 This human Adiponectin ELISA kit is designed to measure the concentration of human adiponectin from human serum/plasma, human adipocytes, or conditioned medium. Adiponectin by ELISA kit used to measure serum adiponectin in human female after induction of acidosis (Disthabanchong, et al., 2010). Metabolic acidosis lowers circulating adiponectin through inhibition of adiponectin gene transcription. Disthabanchong, Sinee, Niticharoenpong, Kannika, Radinahamed, Piyanuch, Stitchantrakul, Wasana, Ongphiphadhanakul, Boonsong, & Hongeng, Suradej 2010. Nephrology, dialysis, transplantation : official publication of the European Dialysis and Transplant Association - European Renal Association: gfq410-.